2/19/2014 The Lord said, "Purchased with My Blood" "I am the Holy One of Israel / Make it Known, Make it Known / offer up Praise" ..."tell, tell, tell / let My Glory cleanse / awaken My People / to what I’m about to do / harken, harken / be not dismayed, trust…. Awaken My People / to what I’m about to do was a command in which I knew all I could do was to report as He had already told me to do. “America” is one of the reports I haven’t written up to this point. I have thought many times how much America has changed since I was a teenager. It is a sad thing to me. I recall when the Lord told me, “You are judged as a person, as a family, and as a nation. Little did I know I would have a hand in reporting the Lord’s judgement concerning America. When those powerful words came forth “America, America, America,” they decreased in volume and the tone changed gradually going into the last Word, America, which resounded in me, “Look what you have done to yourself!” I’m not saying that was the actual thought of the Lord, but “Look what you have done to yourself,” was what I felt within my being at that moment. Remember, God gives here a little and there a little and after the portrayal of the Man-Child the Lord revealed we were going to prophecy at this Nation's Capitol. My Power is here / united we stand / My judgement will shake this earth / I have warned / White House / Go / prepared be the way of the LORD / My time crucial / matters in hand & out of hand / all matters are ultimately Mine / arise / Stood up. / Sat back down. Blow the SHOFAR three times / 3 long blasts / didn't I send Elijah & Elisha to King's matters / were they not warned / don't look at the task, but rather look at the purpose My son / the Most High has spoken. I can tell you all of what the Lord indicated in the above Word came to pass, but only information concerning America and Washington DC are revealed in this report. On 11/5/2013 we left home on a trip the Lord had revealed would last three weeks. We did not know all of our destinations. The Lord had told us to look for Him at every appointed place on the trip. We arrived in Washington DC and for two days 11/8&9/2013 we toured different sites in DC and monuments of various presidents. It was very apparent from reading the writings that God had used these men in molding America. We knew this was part of the Lord telling us to look for Him at every appointed assignment. We were certainly close to one of our assignments. The tenth of November, 2013, the Lord said, “Let this day be marked." 11 AM, we parked close to Teddy Roosevelt’s Memorial & walked to the Capitol Building in Washington DC as the Lord had instructed us to do that morning. (F) was with us as the scribe. We sat on the steps of Grant's monument in front of the Capitol and not knowing what to do we decided to have a Golden Meeting. We removed our shoes, stood, circled & washed at the Laver. We stood in silence waiting on the Lord to give instruction. 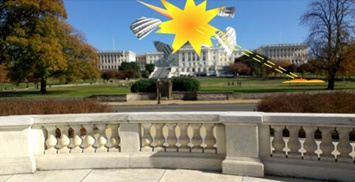 Then (K) saw something come out of the sky & bust through the big dome on the Capital building. He saw it burning, but didn't know what it was. We arrived at the White House and held another Golden Meeting with the Lord at a bench across the street in a park. The Lord instructed us to leave our shoes off and walk to the temporary fence where we stood for a while when we arrived. 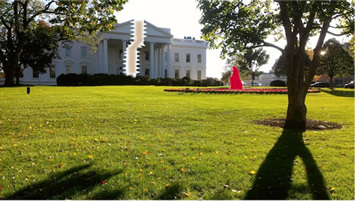 It was directly in front of the White House. Note: After arriving back home we asked the Lord about putting up this prophecy information. He revealed,"Yes, but filtered." “As surely as the LORD lives this house will be divided & not stand.” The LORD had (K) draw a line down the center of the White House with his finger. He 'saw' the White House completely split apart into two pieces. “As surely as the LORD lives, you are clean on the outside, but inside you are full of wickedness & falsehood. Your curtain shall be removed & your falsehood will be exposed,” says the LORD. “As surely as the LORD lives, your secrets shall be revealed by the SPIRIT of the LORD. “As surely as the LORD lives, a spirit of death shall sweep this nation because of the lack of holiness. It is so,” says the LORD. “As surely as the LORD lives, these signs that I have spoken shall come to pass,” says the LORD. Saw the fountain in front of the White House at one point become blood. …. I had a vision and saw the Lincoln Memorial in front of me. Then off to my left coming out of the sky was an asteroid, which I knew to be a part of the same asteroid shower that will hit the capitol building as well. This asteroid fragment went through the top of the Lincoln Memorial and a lot of that building was destroyed. I then saw the word “Deceit.” The Lord then said, “They do not live what they advertise. All shall know My hand done this.” The Lord then gave me the understanding that I was to draw what I had seen in the vision, as well as the vision He gave me before when God was showing us we were to leave and go to Washington D.C. to declare His judgment. A personal Golden Meeting taken from the Repository of Rhema words. Welcome in this place. Likewise My King. Pressure is coming to those not in covenant. I will humble the haughty, says the Lord. The lofty shall be brought low. This will be My doing. Enter into covenant now. Waste no time; calamities are coming, destined and preordained. Without My covenant protection you will not survive, Amen. My protection is available to those who seek Me and follow My ways. I will not fail you, I keep you by My power. Enter in now. Disobedience will not be tolerated. The enemy seeks the disobedient out and brings destruction to their physical. Keep him out by obedience. Yes, Lord. Know I have loved you. Likewise My King. That is all for now. You may go.